Mystery has surrounded today’s broadcast in 3D of the Premier League clash between Arsenal and Manchester United. Sky who are claiming (incorrectly) that it is the first TV company anywhere to “broadcast a live 3D TV sports event to a public audience” will not disclose which 9 pubs are kitted out with the necessary 3D TVs. They’ve done a very good job of keeping it secret. A list has been going round on popular forums including Digital Spy which is almost certainly incorrect. In fact it appears to be completely fabricated. Sirocco in London is definitely not showing it, a number of people have said Qbar in Dublin is a no-no and The George in Liverpool Street has a sign outside saying “no 3D football”. The info on the pub in Ealing is legit which I’ve managed to confirm unequivocally BUT it is being shown in a private room for invited press and other contacts of the pub only. The Drayton will be showing a first-come, first-served rerun of the game at 7pm, and the other pubs could well be doing the same. I hope to update the post with the actual, final list of the 9 pubs so do tell me if you have the info. You can contact me on Twitter or post in the comments below. One thing is for sure… If you definitely want to see a game in 3D, go to a match, or as one Twitterer suggested… stay home, put on Sky Sports, and drop acid. Incidentally, the 3D TV being used is a special 47″ model from LG to show the game in the pubs. More info on the technology behind the broadcast is here. UPDATE: My review of the 3D broadcast is here. http://twitter.com/ThickBleach reckons there’s a pub in Newport with it on. 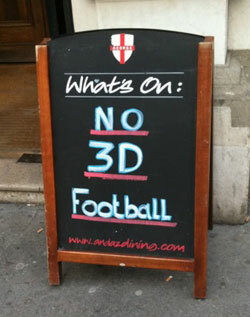 The George in Liverpool St have put a sign out saying “no 3d football”…. The “world first” part is “to a public audience”, which hasn’t been done before afaik. so much for making the experience available for fans and regulars! 9 pubs, some with just private back rooms. not exactly the same as the Rugby next weekend! Ended up at the Railway Tavern, yes “invitation only” but just had to ask the bouncer nicely and we got in! Two thumbs up to 3d, very impressive.